TMS is a standard outpatient procedure, often done right at the doctor’s office or clinic. Each session lasts approximately 30-60 minutes. Patients sit comfortably and alert in a specially designed TMS chair while the magnetic coil delivers highly focused pulses to the regions of the brain that are thought to regulate mood. Side effects usually consist of a mild headache or sensitivity where the treatment occurred. Other than that, there is no recovery time required and at the end of each session patients are immediately able to resume their daily activities. What should a patient expect during TMS Treatment Session? TMS treatment is non-invasive. There is no anesthesia or sedatives so patients are awake and alert the whole time. For the patient it is a very straightforward process. But there are some important basics to take into consideration. Below is a list of the 3 main elements to a TMS Treatment Session that every patient should be aware of: The Coil, The Chair, and Earplugs. *Please note that this information is in reference to the NeuroStar TMS device, and while similar to the MagVita and Rapid2, they are not identical machines. This information is not particularly reflective of Brainsway and Deep TMS. 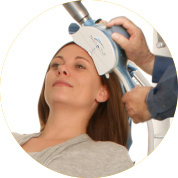 During each TMS session the TMS treatment coil is gently placed on the head over the left prefrontal cortex, delivering focused magnetic stimulation directly to the area of the brain thought to be involved with regulating mood. The TMS treatment coil then proceeds to generate highly concentrated magnetic fields which turn on and off very rapidly. 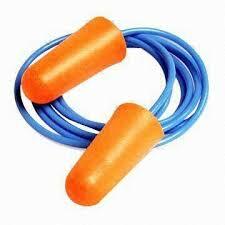 These rapid pulses make loud ticking noises which is why many patients elect or are made to wear earplugs (see note below). The TMS treatment itself is administered by a trained TMS technician under the supervision of the TMS prescribing psychiatrist or doctor. The TMS technician or the prescribing doctor will always be present to monitor the patient during the treatment. The patient should be able to stop a treatment at any time by asking the staff member present. 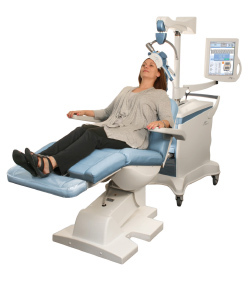 For each TMS session, patients remain awake while sitting in a specially designed treatment chair, shaped much in the way of a dentist’s chair. The seating is relatively comfortable and reclines. During each TMS session, patients are awake, alert and may talk with the TMS technician, watch movies, listen to music, or read. Most technicians are okay with patients choosing to bring their own headphones (providing they are not metal) so they can listen to music. Again, there are no sedatives or anesthesia administered during TMS Therapy, so you will be alert and awake the entire time. The TMS coils produce a loud clicking sound with each pulse, much like an MRI machine emits a loud tapping noise. Patients will want to bring earplugs. A lot of times earplugs are provided by the clinic or doctor’s office. But if you are picky about what goes in your ear, then it is highly recommended you bring your own personal ear plugs. Many doctors and technicians don’t merely recommend them, but require them, citing hearing protection safety. Because TMS uses magnetic pulses, before beginning a treatment, patients are asked to remove any magnetic-sensitive objects (such as jewelry and credit cards). Interested in seeing TMS in action? Here are official company videos from NeuroStar, Brainsway, Magstim, and MagVita.